A commuter’s concerns about the facilities at Bognor Railway Station have been echoed by town councillors, who want some action to be taken. 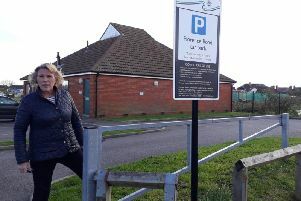 Discussing Felpham resident Andy Perry’s calls to improve the ‘grim’ bike storage area, at a town council planning and licensing committee on Tuesday (January 29), councillors said that is only one part of the problem that needs to be addressed. Bognor town councillors Jan Cosgrove (left) and Matt Stanley. Photo by Derek Martin Photography. Independent councillor Steve Goodheart said: “The work they have carried out at the station is great but it still doesn’t quite finish it. There are still areas that need to be looked at. “We need to have some kind of liaison with the station master so we can have an ongoing dialogue with our concerns about the state of the station. Hopefully it will bring some improvements. “It’s not just where the cycles are. It’s not just the large open space within the rail station which is completely unfriendly and unwelcoming. It needs to be addressed. "I understand there was plan in motion for the cafe allegedly, and also to do something about retail but we’ve been told that for many years now. It is not being addressed at all." Labour's Jan Cosgrove agreed. He said: “We have not seen the quality of improvement that we should have. They've spent an extraordinary amount of money [but] the roof still leaks and it is unfriendly. "You cannot get refreshments there, either while you’re waiting, or walking through or to take on the train. It’s extraordinary. It is self defeating for a railway company to be so blind [to what people are asking for]. Responding to concerns about the state of the station earlier this month, a spokesman for Southern said: “We are aware of these issues and are currently tackling those within our control. However, Lib Dem councillor Matt Stanley said he thinks the rail provider, in its response, 'missed out' the main issues raised by concerned commuter Andy Perry. "His main concern was the unfriendly atmosphere which was due to the anti-social behaviour, drinking and smoking," councillor Stanley said. "They haven’t mentioned it or appear to be willing to address it. I do think we [the town council] need to be more involved and ask hows and whys." Former mayor and Conservative councillor Phil Woodall argued that a lot of problems arise from 'everything being so expensive'. Councillor Goodheart said the use of the land that the station sits on also 'needs to be brought into the conversation'. He added: "There is a very large car park which is well used but the northern section is now closed off to pedestrian use. "It is an area used partly as a car park and then not used at all. Part of land could be used for buses to free up space. They have also got a raised garden area, which could be made more user-friendly for people being dropped off or even buses." What do you think about the condition of the station? Let us know on our Facebook page.